Last night my son suggested that after I have done the backup (which I have) I should do the factory reset and reinstall myself. Not keen on that idea. I was reading on line – always a dangerous thing to do – of people who did just that, made a stuff-up of it and locked themselves out- then had to send the machine to Apple for repair and that was not cheap. I sometimes think that we go on line to find information and end up scaring ourselves half to death :o) We are fortunate in that there if a fairly large Apple Shop in Rundle Mall in Adelaide, so it’s an easy thing to hop on the coach, do what has to be done and coach back home. Well yes it does mean 10 hours on a coach ( 5 x 2) but at least you know that it has been attended by Apple Techs. Or, if I am feeling generous with myself, drive down, get the machine attended to, book into the Sage, spend a quiet night in Adelaide and drive home the following day. Not going to happen mainly because I am going to be in Adelaide several times in August so I’ve waited this long I can wait a few more weeks – I think…..
With regard to the weather, Adelaide is taking a bit of a battering and another storm front is moving in. We get some of the left over rain, which is always welcome. But looking at the path of the storm front, it has gone through below us, which is about normal for these things. 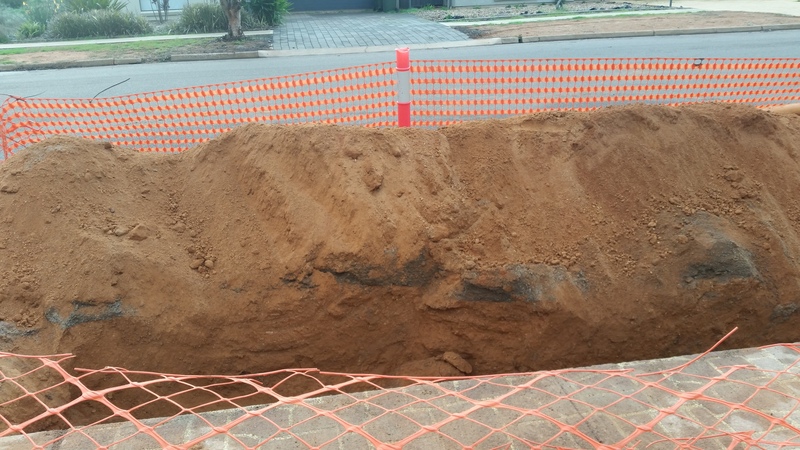 You may remember – or you may not know – but in November of last year an electrical fault was discovered underneath my driveway, which had to be part dug up. The fault was fixed but then they discovered a gas line fault and that could not be fixed. There was not a part available in Australia. They put in a temporary patch and filled it all back in, promising to come back soon as they had the part and repair the fault and re-concrete that part of my driveway. As I said, that was last November. The workman arrived today and not only did they open the trench, they extended it. They kindly came yesterday and suggested I park my car out on the roadway. Anyway there were trucks and vans and a back-hoe and men with shovels and they dug up the area. Then some other men arrived and they inspected the hole and the pipe and dug two more holes, then extended my trench on either side and I had to go out and move the car so that they could do this. Anyway, that’s it for today and they will be back again tomorrow to carry on working. Looking at the trench I thought it would look just right with a couple of WW1 Soldiers sitting in it. I know, I have a very warped sense of humour!! Took Annabell shopping and as we entered the supermarket she met a friend and chatted. I wandered off. When I came back, she looked and shook her head. 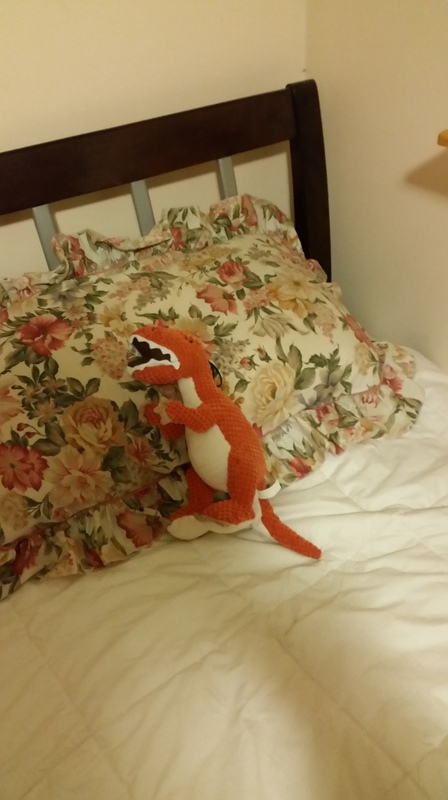 Well, what can I tell you – it’s a nice Dinosaur and I know BJ will just lurve it. (He does!) Then she wanted to know if he has enough toys already and I thought, you can never have too many toys. Feel free to disagree. The work on the trench continues and the gas to the house has been disconnected for the moment. I can make myself as much tea and coffee as I wish, but I can’t cook anything since we have a gas cooker. By the time Annabell comes home ( I go and collect her) from her ladies Coffee Morning, it might even be back on again, although after talking to the gas fitter, it might be off for most of the day – do the repairs, test it, then turn the gas back on. Anyway, if I get peckish there is always the Microwave. 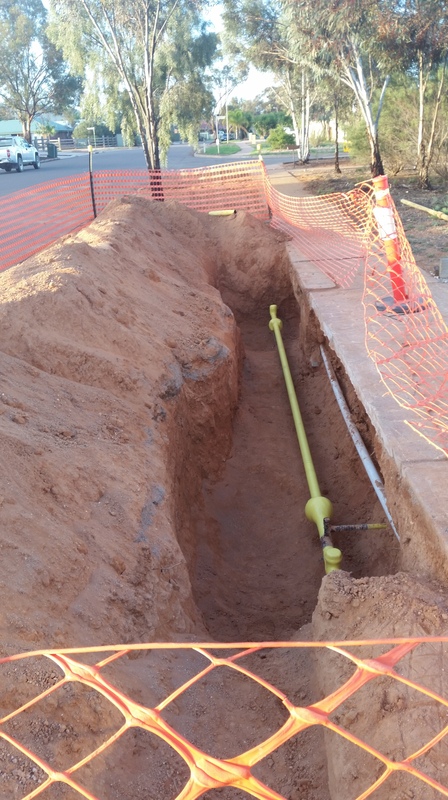 Wednesday evening: The new gas pipe has been installed and the repairs completed – howeffer…. the trench – nice though it is – will not be filled in until sometime tomorrow. Then we will have another wait until they finally get around to doing the concrete – in the fullness of time… Although, having said that, they could actually surprise me. I checked with Sam, he says in fact no, Benji couldn’t ‘pawsibly’ have enough toys. Here’s hoping the repairs get completed quickly and without further adieu. Woo MacHoo ( Scottish Version) Thank you Sam, thank you..